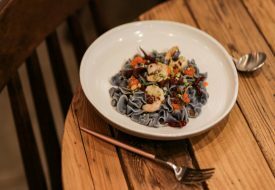 Take your supper up to the next level with Le Binchotan’s Supper Special 2019. The 2019 Supper Special at Le Binchotan is set to begin on 25 April – and it has returned for a longer run than before, spanning three different months with different dishes being presented every few weeks. 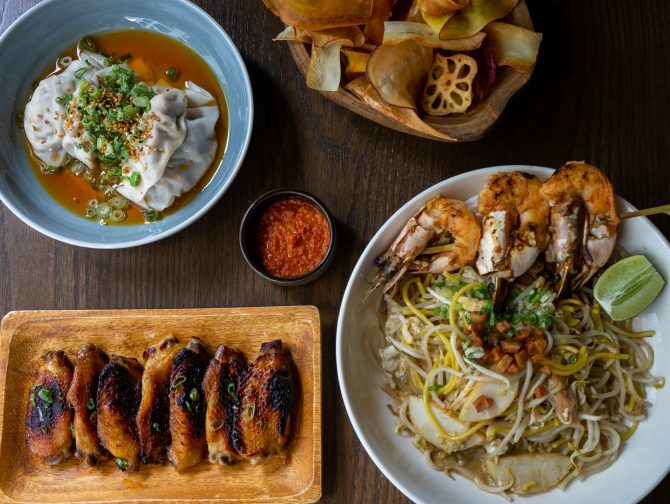 First introduced last year as a National Day tribute, it then continued on a semi-regular basis after a steady stream of requests came in for more of chef-owner Jeremmy Chiam’s distinctive take on familiar and beloved Singaporean favourites. This year’s Supper Special is a much bigger affair, involving guest chefs and their takes on their favourite supper dishes. Indulge in dishes by chefs ArChan Chan of LeVeL33, Sam Chablani, and Damian D’Silva, who will bring intriguing new twists to the suppers. 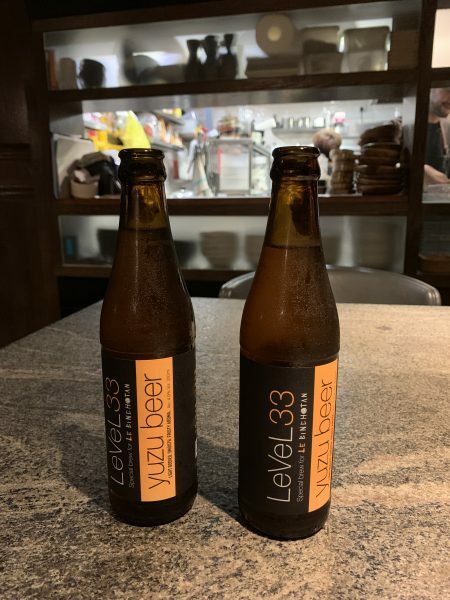 If you’re heading down to Le Binchotan during the Supper Series, start off your meal with this Yuzu Beer ($15++) from LeVeL33. A brew inspired by the dynamics of this year’s chef collaboration, we loved how smooth and bright this was, thanks to the usage of fresh yuzu zest. It also pairs well with many of the (spicy) dishes on the various supper menus – so this is a must-try, especially since it’s exclusively retailing during the Supper Series! 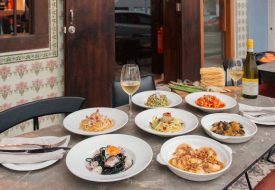 For the three-month-long duration of the Supper Special, Chef Jeremmy will share a total of three big plates, each paired with a small plate. Every pair will take centre-stage for for some time, as well as with the guest chefs. 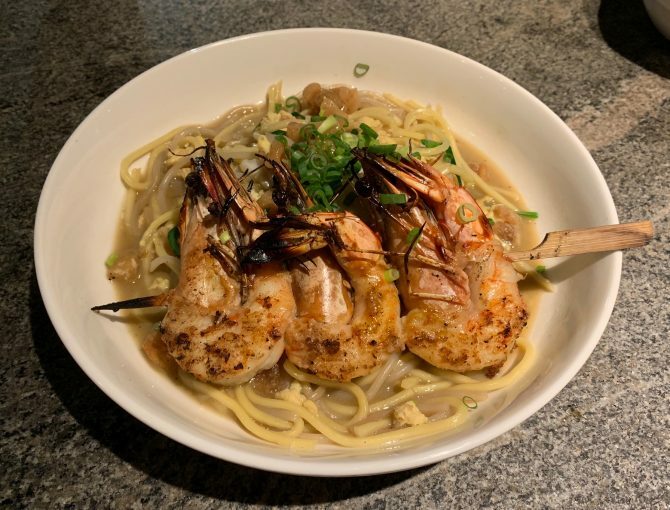 Regulars and fans will be pleased to hear of the return of Chef Jeremmy’s popular Hokkien Mee (S$17 for a la carte), which was introduced during the first Supper Special. Made with a French bisque-style stock of lobsters and prawns, and topped with gigantic angka prawns grilled over binchotan (white charcoal) and house-rendered lard pieces; one bite and you’ll know why people keep coming back for this. Top it off with Chef’s special house-made sambal belachan – deliciously pungent and wickedly fiery – and you’ll be digging in for more, even as you cry tears (of happiness) from its heat. The other big plate we loved was the Uni Congee (S$22 for a la carte), inspired by the comforting Cantonese jook. This levelled-up version is prepared with premium Akitakomachi rice, a house-made scallop broth, century egg, foie gras and generous lobes of uni. Savoury, fragrant, and wonderfully luxurious, we savoured every mouthful – if only all congee could be as scrumptious as this! 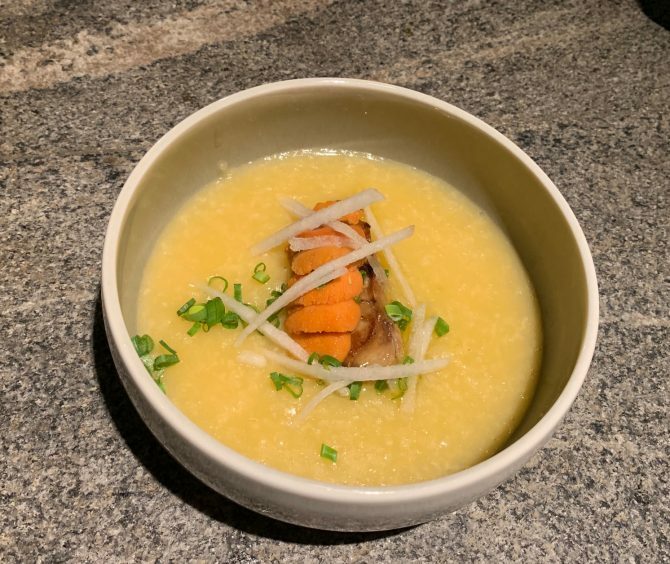 If anything, having both foie gras and uni together on the congee was a bit of an overkill, both being strongly-flavoured – the congee was amazing on its own, and we could imagine it working well with slices of a mild fish, like pomfret or grouper. Meanwhile, Chef Jeremmy’s small plates are a mix of all his favourite types of bite-sized goodies. 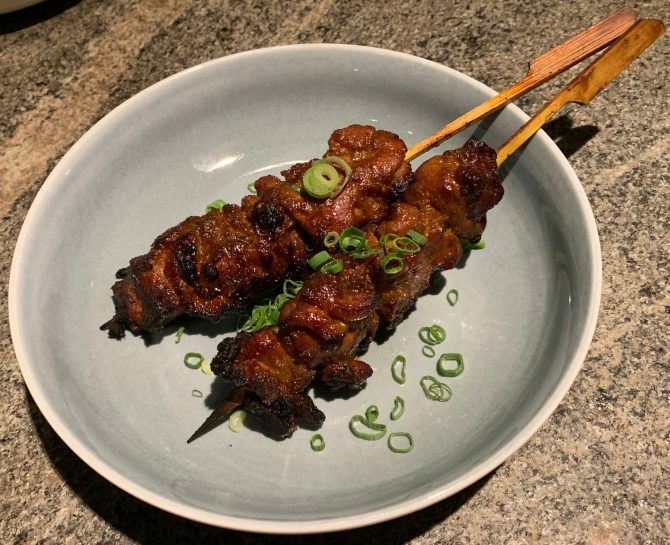 A must-try would be the Kicap Manis Chicken Satay (S$10 for a la carte): generous skewers of binchotan-grilled chicken thigh marinated with a toothsome mix of kicap manis, lime juice and spices. The heady smokiness infused into the meat, thanks to being grilled over binchotan, was so very addictive and has probably ruined every other satay for us, ever. We also liked the Beef Short Rib Dumplings (S$15 for a la carte), made with hand-shredded Angus beef short ribs braised for 16 hours in Japanese vinegar and served with housemade la you (chilli oil); and looked like upsized versions of chilli oil dumplings, but tasted like chilli oil la mian with deliciously tender beef ribs. For a platter that would go well with the Yuzu Beer, order the moreish Ebi Crackers with Sambal Belachan (S$7 for a la carte): rice paper coated with crushed ebi, fried to a crackling crisp and served with the fiery housemade sambal belachan. Kickstarting the Supper Special 2019 as well as the start of Jeremmy & Friends events from 25-27 April, will be Chef ArChan Chan, Executive Chef of craft brewery and restaurant LeVeL33. The cuisine she presents in LeVeL33 incorporates beer-brewing elements into a Modern European style, and she hopes to bring over some of these elements into her dishes here. Chef ArChan’s dish of Stir-fried Clams with XO Sauce (part of set, but can be purchased as an add-on for S$19) is also inspired by her memories of working in Sydney. 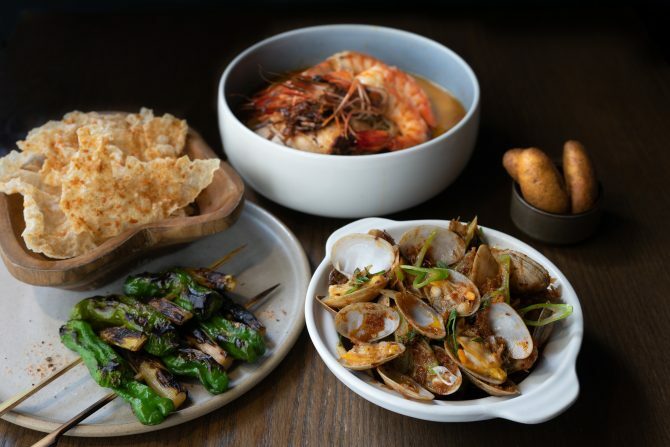 For this dish, Chef ArChan makes the XO sauce from scratch with dried scallops and jamon, before stir-frying clams with LeVeL33’s Blond Lager. This is paired with mantou made from scratch with dry spent grain, which added a delicious nuttiness; and were crisp on the outside while fluffy on the inside thanks to being pan-fried. Our advice? Use the mantou to mop up every single bit of the XO sauce because it is worth it – fragrant, savoury, spicy, with the flavours of the sea and that beautiful wok hei; we wanted to just drown ourselves in it! Chef ArChan’s small plate Grilled Shishito Peppers and Fermented Leeks with Hopped Salt (part of set, but can be purchased as an add-on for S$8), consists of skewers of her favourite shishito peppers. These skewers bring together the refreshing and light flavours she feels are especially suitable in the current humid weather. During the month of May, head down to experience Chef Sam Chablani’s cheekily famous #noburnnotaste philosophy, as he serves up a #noburnnotaste Platter (part of set, but can be purchased as an add-on for S$18) from 9-11 May. 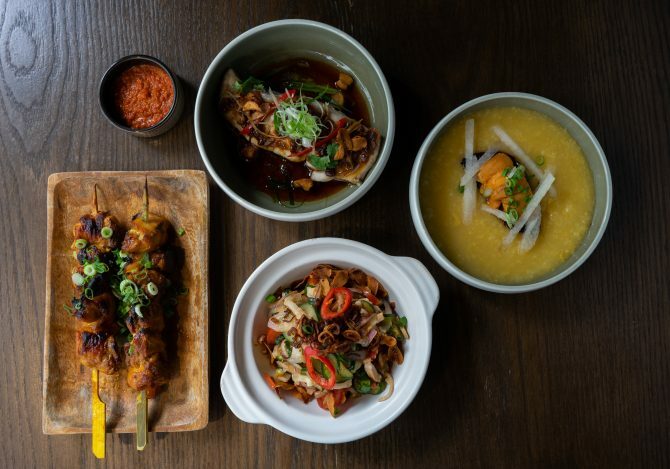 Hailing from now-defunct barbecue kitchen Fat Lulu, Chef Sam’s dish comprises of a previous Fat Lulu’s favourite, the Iberico Pork Sataytay; grilled chicken wings; and Sam’s Phu Quoc Pork Ribs, inspired by the surprise obsession he developed after tasting said ribs at a street food stall in Vietnam. No burn, no taste indeed. The meats, especially the chicken wings, have a lovely charred flavour to them that linger on the tongue – dip them into the accompanying sambal, Le Binchotan’s house mix with yuzu, and you’ll be in grilled meat heaven. 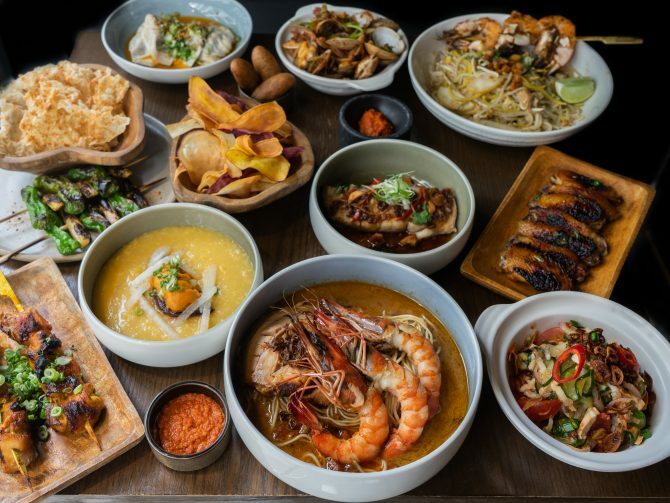 On 6, 7 and 8 June, Chef Damian D’Silva, known for his passion for Singapore heritage food, will be cooking up what he calls “dishes that comfort the heart”. These dishes can be eaten on their own, or with a carb – he recommends rice porridge! The Steamed Fish (part of set, but can be purchased as an add-on for S$15) is one of Chef Damian’s favourite dishes, and a wonderfully nostalgic Chinese dish. Filleted threadfin is marinated it in homemade tau cheo, a traditional Asian condiment of fermented soybeans, before being steamed for exactly 6 minutes. The fish is then topped with fresh pork lard, shallots, garlic and bentong ginger. Tender and fragrant, this dish brought us back to memories of having rice porridge with that verysame home-cooked dish; and tasted of childhood laughter and familial love. The Pork Belly with Cucumber Salsa (part of set, but can be purchased as an add-on for S$8) is Chef Damian’s small plates contribution: light despite the pork belly, with plenty of fresh and tangy elements. Those with a low spice tolerance, beware of the heat this dish brings! It was tangy and refreshing despite the sharp heat from the chilli, thanks to the cucumber; and helped to refresh our palate so that we could keep eating! 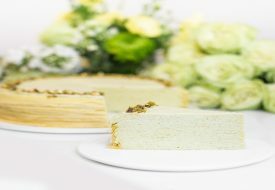 Supper is almost always a good idea, and with the spread of dishes offered by the chefs at Supper Special 2019, at the very affordable cost of S$35++ per set, what’s stopping you from grabbing a good meal (or more) these few months? Click here for reservations and more information.